This week is a long run, through some new places, with many challenging water stops to support. If you can help support, please let me know. First part of the run is out to the Saugus-side of Breakheart. We’ve done this before: Main St to Green St over to LynnFells all the way to Breakheart. There will be a water stop in the lot there. Second Part, circle Breakheart and back to the water stop. No problem. Third Part, head back down the LynnFells and turn right at Â the set of lights at Main St in Saugus. Follow that through the hills and it will become Farm St in Wakefield. Keep on going all the way to Wakefield High School for another water stop. Fourth Part is a place we haven’t gone before this training season. Leave the High School and head down Farm St to the end where it intersects with Water Street. We’ll be turning to the right this time, and work on crossing the street to the other side because you’ll quickly turn left on Montrose Ave. There is a gas station on the corner of Water and Montrose. Wind your way along Montrose until you get to the end, where it hits Salem Street. Turn left onto Salem. The road here will hit a fork about a half mile into it, bear right here onto Lowell Street. Lowell Street will bring you up to Lake Quannapowitt by the Gingerbread Construction Company. Stay right there and start to circle the lake counterclockwise. You’ll find a water stop in the parking lot by Converse at the Rt128 end of the lake. Fifth Part, keep following the lake . Head over to the other side of the lake turning left on North Ave. At the softball field turn left on Church Street. Run over to the big church and then turn right on Common St (at the Common) and that will take you to Main Street. Look for a water stop at Nick’s Pizza. Last part is easy and you’ve done it many times already: Follow Main Street back to Brueggers to finish up your 18 mile run. For people training for a shorter distance: your 9 mile route is to run our to Breakheart, around and back to Brueggers the way you came. As for the water stops. I need a dedicated volunteer who isn’t running, or several people to park their cars along the route. Please let me know how you can help. This is a big run, and not easy to coordinate as the cars start to spread out. Please leave a note here if you can help and I’ll have a plan ready tonight. 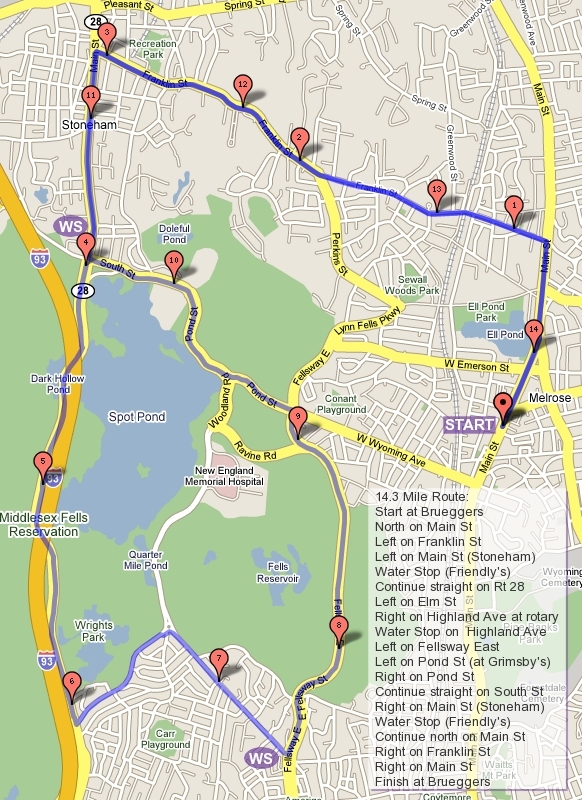 Seven weeks into training for Baystate, at the end of this run you’ll be halfway trained. To mark that point in your training we’ll be running the old Melrose Law Enforcement Memorial Half Marathon. Back in the day, when Marathon Sports-Melrose was Runners’ Edge, the Boston Run to Remember was the Melrose Half. We’ll be running over to the start and then following the course almost in its entirety. Starting out Main St we’ll head up past Ell Pond, turning left on Melrose St and then left on the LynnFells Parkway. As you pass the High School you’ll cross what was the starting line for the Half. Continuing past the Middle School you’ll hit a set of lights at Tremont St. If you’re running the short route continue straight (you get to take the lead this week), if you’re running long turn left on Tremont, then circle Ell Pond by taking lefts on Lake, W Emerson, Main, Melrose, and LynnFells, putting you back at the start line. For the record I didn’t make that part up, it was part of the race. When you get back to the corner of Tremont, now you go straight and chase the shorter route runners. The first water stop will be at Grimsby’s, with Brian Walfield happily pouring refreshments for you. The next leg of the run continues on the LynnFells and onto the Fellsway East. You’ve been here before, a few long hills through this quiet wooded section of the run and you’ll end up at the rotary at Highland Ave where the newspaper boy sits. Turn right onto Highland Ave and head up to water stop 2 at the other end of the road. From the water stop, if you’re running short go straight around the front side of Spot Pond to Pond St and back past Grimsby’s. If you’re running longer go left at the rotary onto Elm St. Circle Spot Pond by taking rights on Rt 28 (Main St), and through the Straw Point parking lot cutting the corner where Friendly’s is. Run past the Stone Zoo, up past the hockey rink, through the rotary back to water stop 2, which is now water stop 3. From there you head over to the left on East Border Road, up the hill where you’re allowed to curse me to your hearts content, left back onto the Fellsway East, and back to Grimsbys for yet another water stop. Keep going on the LynnFells Parkway up to the high school. If this were the 1990s you would have cut into the field by the high school and circled the track while all the spectators watched you cross the finish line in agony. Well, the track isn’t there anymore so we’ll head back to Brueggers instead, past the high school, right on Melrose St, right on Main, and stop at Brueggers Beach for some coffee and sunshine. Brian and I will handle the water stops. Regarding future water stops, I’ll be away for each Sunday in September so I need help coordinating water stops over those weeks. Please take a look at the runs over that time period and plan on pitching in at least once. These stops have been there for you every Sunday, for some of you for many years worth of Sundays, please take the opportunity to give the support back. You can still run, just plan on dropping your car at a stop. I would like groups of 3 or 4 people to step up and volunteer for a week. Talk to your running buddies and sign up for a week. There will be a sign-up sheet at Brueggers over the next few weeks. So… Who’s in? ROLL CALL! ADDITION: Ooops, I just realized my directions left all the shorter loop people standing at Grimsby’s. The 7 mile route will take you down W Wyoming, from there you take left on Main St and finish at Brueggers. If you want to run 8 miles, take the LynnFells to Melrose, to Main St and finish up that way. With a little break inÂ miles last week , but a step up in hillage, this week we bump up the distance to 16 miles. This gives us a few more miles to learn a few more neighborhoods to run through. The destination this week: Winchester Highlands. The start and end of the Horn Pond run will reversed this week, so we’ll start up to Franklin St, going left up into Stoneham.Â After Dunkin DonutsÂ you’ll get toÂ a set ofÂ traffic lights atÂ Summer St, turn left. This will wind you over to Main St in Stoneham. Cross there and continue on to Marble St, which will take you over I93 to Forest St. You’ll find the water stop on the other side of the overpass on Eugene St to the left. After the water stop head down Forest St to Highland Ave on your left. There will be a sign for Winchester Hospital directing your turn left. Run up the hill to the hospital and look for Reservoir Road on your left. Turn on to that road and enjoy my favorite road of the Fall Training Season! You’ll come up to a nice view of one of the reservoirs in the Fells. The quiet woodedÂ street lined with gaslight style street lights will take you past stately homes. Oh, and there’s a hill, but don’t worry about that. The street will bring you back down to Highland Ave, go left there and follow Highland to the water stop. Note there will be a 5 way intersection that may be confusing. You need to go straight across, not the street to your left, or the two streets to your right, straight across to stay on Highland. This will bring you through a series of hills ending at water stop 2. From that water stop turn right onto Main St, Rt38. This will take you down to another confusing spot… a rotary. So enter the rotary going counterclockwise as if you were driving. There will be a small side street first, don’t turn on that. Then there is a major street, Main St still, that’s where you want to turn. I believe there is an historic marker for Symmes House or something like that. Once you’re on the right street (and if you’re not, I’m not gonna be able to find you) follow Main St to a fork where you bear right on Washington Street. This will bring you to yet another confusing 5 way intersection. You want to continue straight across on Washington St, not right on the one street there, not either of the two streets to your left eight, straight onto Washington. If you picked the wrong street after crossing you’ll pass Winchester High School, turn around and try again. The right street, Washington, will bring you past a church that typically has a policeman directing pedestrians across. Feel confident you went the right way if you see a few churches. Washington St will bring you up to Forest St, at the corner with the Gingerbread Construction Company. Having run Horn Pond already, now you know where you are. Turn right on Forest, run up the hill, then the next, and then even more hill until you get back to the water stop. From this water stop you’ll run over I93, turn right on Park Street, come out at Friendly’s, turn right and follow the Spot Pond Loop all the wayÂ around to Pond St, where you turn down towards Grimsby’s. Continue on to Wyoming and turn left on Main to finish! Ok, short runners. You have options, as usual. The basic route is to start with the long, run to the water stop, and run back to Park, past Friendlys, continue straight past the Stone Zoo, turn left on Pond to Grimsby’s but turn left on the Lynn Fells out past the high school to Melrose St to Main and back to Brueggers. That’ll be 8. Another 8 mile run would be to start at Friendly’s when the group runs by and run the middle of the route, out through Winchester and back. That also will be 8, and you get to start a little later, and you get to see some nicer streets, and there’s more hills. Ok, now for the business part… I need a second water stop car. I’ll do one stop, but I need a second car. Who can help? We can either drop your car off prior to the run and I’ll get you to Brueggers or we can coordinate once the runners start if you’re running less or not at all. I would like to run the middle 6 miles. However we do it, please let me know you’re available… so I know I can run. Week 5 – Hills, Glorious Hills! Last weeks run was enjoyable trip to Horn Pond. 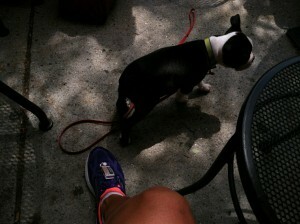 It also included a nice visit from a new friend during our post run hang out at Brueggers Beach. 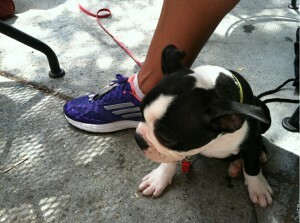 A tired little Boston Terrier puppy named Duke stopped by. We don’t know his owners but we declared him the new SLR mascot (sorry Tucker). So this weeks run will be our first trip to Breakheart in a while.Most of last season’s Breakheart trips were cancelled due to snow I believe, but you don’t get that in the summer time!The run is chock full of hills, put in our way to build up strength in our legs and our lungs, but even more importantly in our heads. Once you conquer these babies you’ll be ready to tackle any hill. Just keep reminding yourself that there is a downhill for every uphill. So the route starts out from Brueggers heading north on Main St. Veer off on Green St to the right and then take a right turn on the Lynn Fells Parkway. Follow that to a set of lights and go left on Main St in Saugus. Keep following that through some warm up hills until you get to Wakefield High School. Look for the water stop car there. From the water stop, continue up Hemlock Road, past the Voc into Breakheart. Follow the path to the right, running counterclockwise through Breakheart Reservation. You’ll hit the hilly side first. Don’t attack the first one, there are at least 5 short steep hills to climb, each rolling down into the next. Once you pop out at the Headquarters lodge on the other side of the park you’ll know the hills have stopped. There is water and a bathroom there if you need one. Continue along the path, bear right at the fork in the path at the pond, and you’ll wind up back at the Voc entrance. Come out there, down Hemlock Road to the water stop. This time leave the stop along Farm St (yes, Main St in Saugus became Farm St in Wakefield). Go up to the end of the road, take a left on Water St and follow that to Wakefield Center. Turn left on Main St and follow that home to Brueggers. If you’re running short, you have a few options. There is a route similar to week 1 for 6 miles. There is the option of running about 8 miles by heading to the water stop then crossing Nahant St to Main St and back. Or you can meet at the parking lot at the corner of Main St in Saugus and the LynnFells and joining us there as we pass by. Then when you come out of Breakheart head left back to your car. I prefer the last option to get to experience Breakheart, the destination part of this run. So I have the water stop, no troubles there. I’ll join you for the romp through Breakheart. So far we haven’t strayed all too far from our home base in Melrose, but this week’s run is the first in the training routes that will make you feel like you really went somewhere: Horn Pond. I’ll need a volunteer to assist with water stops. What this requires is a car. I suggest if anyone running the shorter distance wants to run the more scenic part of the run, they help by parking at water stop 1 and running out to the pond and back to their car. I’ll bring the supplies, you bring the trunk space. Anyone? As far as the route goes, here’s a synopsis of the long route. Starting at Brueggers, we’ll head over to West Wyoming, out past Grimsby’s and straight up to Spot Pond. Take a right along the pond past the zoo, keep going through the lights past Friendly’s, following to traffic lights at the intersection of Park St and Marble St in Stoneham. Here you’ll take a left, run up and over I93 and look for the water stop tucked to the left on Eugene Dr.
From the water stop head down Forest St into Winchester. Take a left at Washington St (the intersection with the Gingerbread Construction Company), and then right on Cross Street. Cross will take you straight over to Main Street/Rt38 in Woburn. You’ll take a right on Main St, then after a block or two a left on Lake St. Lake St will bring you over to… no not a lake, a pond, Horn Pond. The water stop will in the parking lot at the head of the pond. After the water stop, circle the pond clockwise along the dirt paths and paved streets. One the opposite side of the pond there will be a street with a big hill along with a dirt path that cuts the big hill. If you want to do well in your upcoming races run the hill, if you’re feeling lazy and want me to give you crap at Brueggers later in the morning feel free to take the shortcut. Either way you’ll pop out onto Arlington Road along the pond. Look for the markers for the planets along the sidewalk there as you finish your loop along the lake. If you feel like heading back to the car for another sip you can, our take a left on Lake St and start heading back the way you came: Right on Main St, left on Cross, left on Washington, right on Forest and up the series of steep climbing hills to the water stop. From this water stop you head back over I93 on Forest St, but go straight through the intersection with Park St. The street name will change to Marble St when you enter Stoneham. Follow this across Main St where it will become Summer St. Here you’ll wind along a narrow road over to Franklin St. Take a right on Franklin past Stoneham High School and back into Melrose. This will bring you out to Main St in Melrose eventually, where a right turn will turn you towards Brueggers where your long trip will come to an end. If you’re running the short route you have an option. You can run to the first water stop with the rest of the pack and then back along the finishing part of the route for 7 miles or you can meet at the first water stop and run the middle part of the run out to Horn Pond and back. This will be about 6.5 miles but a more scenic run. So who’s helping me and who’s running what? Roll Call!